Used to display moisture content to assess the extent of hidden condensation. Exposes roof leaks and water seepage. For use with wood, sheet-rock, building materials. Dual LCD's show simultaneous relative moisture contend and air temperature (-32d to 122 d). 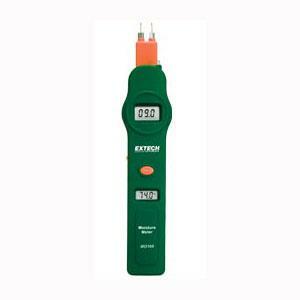 * Please call us with any questions about our moisture meter extech rentals in Oak Grove MO, Blue Springs MO, Independence MO, Lexington MO, Odessa MO, Independence MO and Western Missouri.